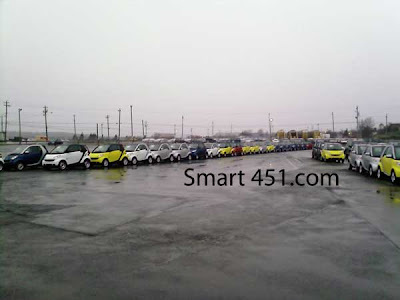 There where only 70 smart's but that number went up to almost 1,000. These first couple photos are smart's in the service area here at the dock. The majority of the cars are parked in the green area below. 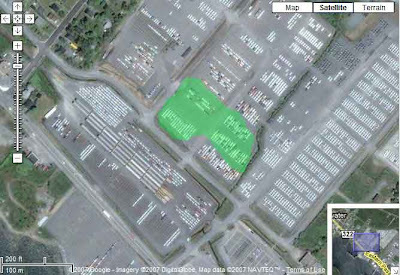 Below is outlined in green the area currently taken up by smart's, its easily the largest single type of car sitting at the dock as most cars come and then get put on trains within a few days. 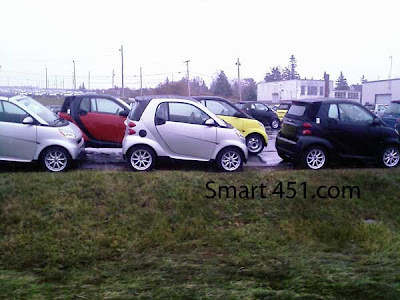 The smart's have been sitting there for over 1 months now. 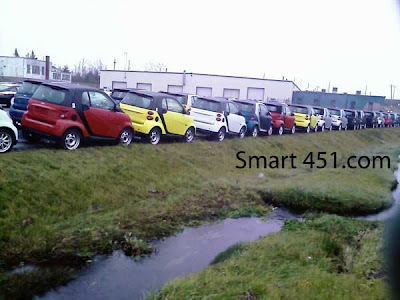 The delay has left almost 1,000 smart's sitting at the dock but its hard to get a good photo of them all as they are up on a hill, but here is a recent video of the cars just wiating for a place to call home. This is the same color and model as my smart car, it might be mine, but I couldn't get close enough to see if it had leather interior.